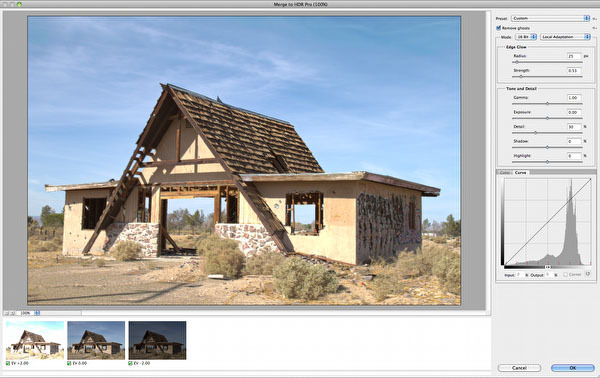 "Integrating DOP Tools into your Workflow"
Once it is again the time when Adobe releases a new version of Photoshop: Photoshop CS5 (Version 12). 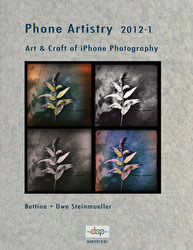 We want to talk about some of the main new features that we find interesting for photographers (we skip 3D entirely). This is the first version of Photoshop that won't support our trusty Quad Mac with Power PC. 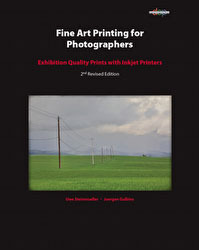 It got relegated as our printing machine using Mac OS X 10.4, Photoshop CS4 and Lightroom 2.x. Our main workstation is a MacPro for some time now becasue more and more tools require Mac Intel (e.g. Final Cut Pro). 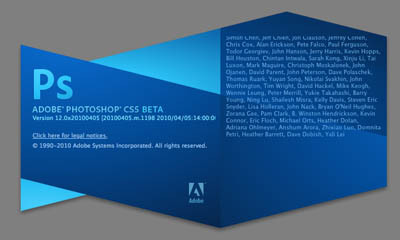 On the Mac you can now use Photoshop CS5 in 64 bit and 32 bit. Adobe had to re-write lots of code to allow this to happen as the basic UI platform for 64 bit changed. The 64 bit version allows you to utilize more memory. Be aware that many of your plugins won't work in 64 bit. That is why we use the 32 bit version right now. The Healing Brush was always a key feature in Photoshop for some years. 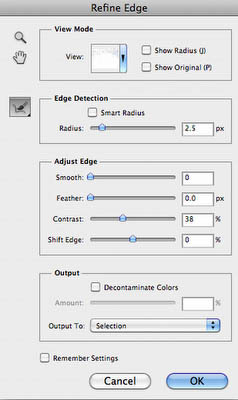 CS5 added a new mode that makes it even better. As outdoor photographers we find wires everywhere. We actually did not miss the wire while shooting but planned to remove them later. In the end the new Content-Aware Healing Brush saved us quiet some time. This was actually a very simple sample but it can work in even more difficult situations. 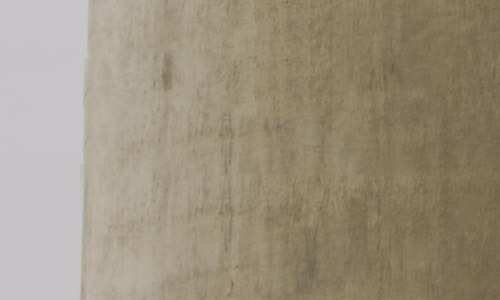 The Content-Aware Brush and Fill help to make retouching faster and easier. For some they maybe worth the upgrade to CS5 alone. We are very happy about this new feature. 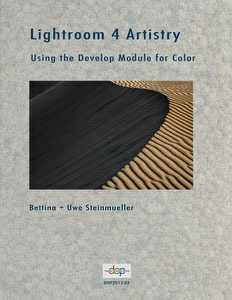 If you use Lightroom 3 Beta 2 you actually get the same functionality. The raw processing and noise removal got improved. We hardly use Camera Raw directly anymore but use the same engine via Lightroom 3 Beta 2. 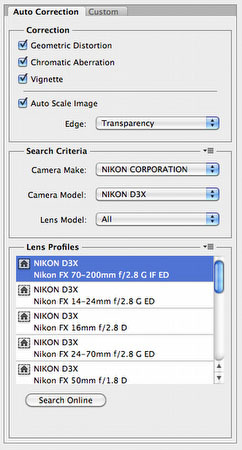 If your lens/camera combination is supported it makes the correction process very simple. Right now the cameras/lenses supported are quite limited. This will change over time. Adobe also delivers a free tool that allows you to create your own profiles with the Adobe Lens Profile Creator and the Adobe Camera Calibration Chart. 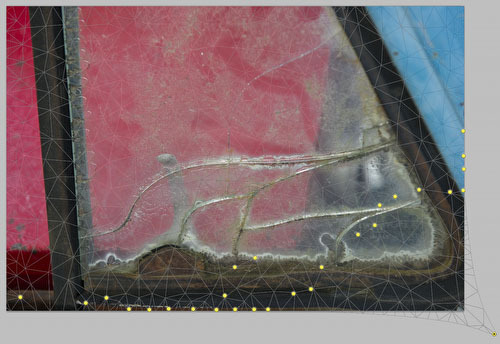 The Refine Edges dialog got enhanced to allow more precise masking (e.g. with hair and other fine details). We did not test it in detail as we rarely make fine detailed masks. to keep the image in 32 bit. 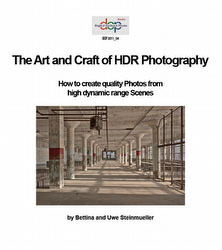 Here we can save the HDR file and use the new "HDR Toning" tool to perform the tonemapping. 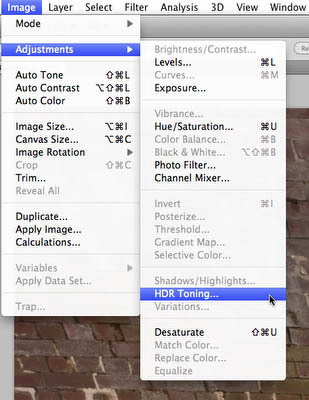 Not sure why Adobe selected this name (we would call it HDR Tonemapping because it reminds us to much of B&W toning). The classic "Convert to 16 bit"
The "Local Adaptation" mode is completely changed and way more usable than in CS4. 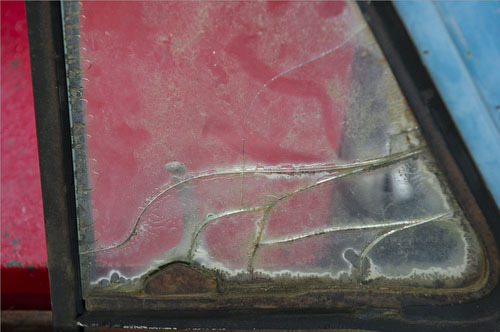 Be careful not to select to high "Detail" settings as this may introduce nasty artifacts. If needed we perform extra detail extraction with our DOP Detail Extractor script. 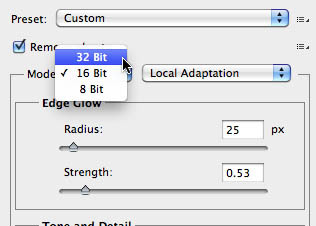 To get a proper impression of your images in 32 bit you better set proper "32-bit Preview Options". 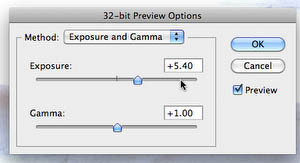 Exposure should be set to 0 and Gamma to 1. If you finally convert to 16 bit you need to do a simple Exposure:0 and Gamma:1 conversion (this leaves the image unchanged). 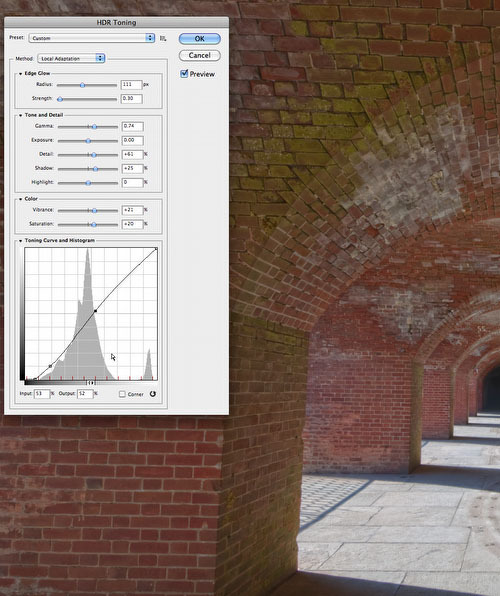 Overall "HDR Toning" is not really simple to use as the interaction of the many sliders make it complex. Best to save the current settings used as a new Preset because "HDR Toning" does not support any "Previous" option (which we consider a major omission). Puppet Warp is a fun tool but many photographers may not see much use of it. We personally used Warp in the past and Puppet Warp is a warp tool on steroids. 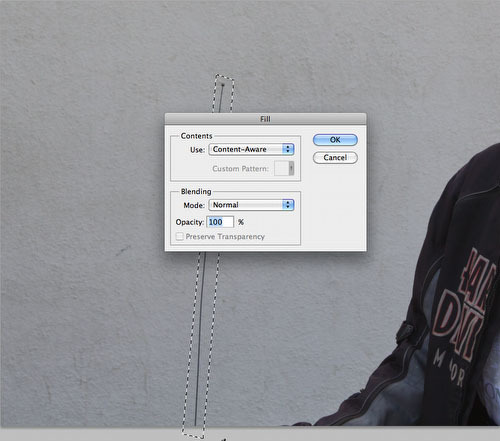 Here is an example that illustrates how Puppet Warp can help even Photographers. The blue area in the bottom right corner is distracting. Yes, you could crop the image but that is not a really good option. We show how Puppet Warp can help. We mark the Nodes to prevent the warping to influence areas beyond these borders (best you try yourself). We warp the corner so that the blue area is outside the image. 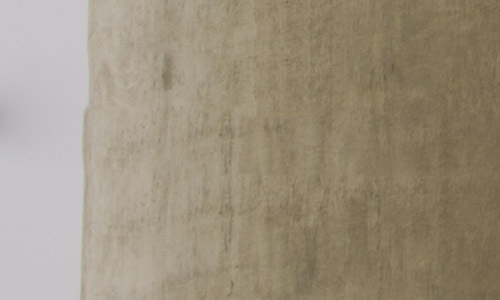 The rest of the image does not get warped much or at all. The final result does not look much distorted at all. Warping is especially effective if you work with organic structures. 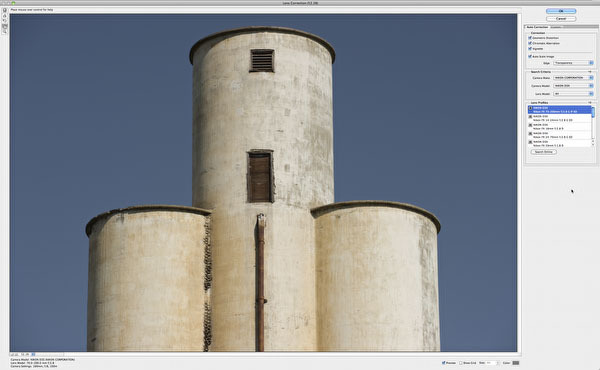 We find that Photoshop CS5 is an powerful new release and for many worth the upgrade.